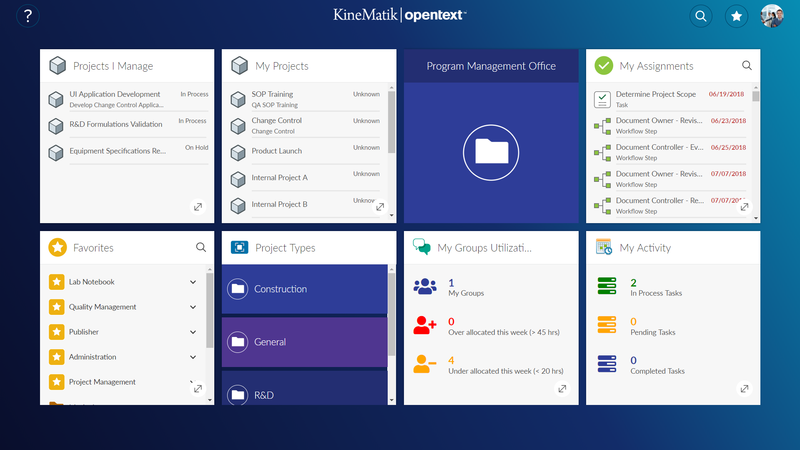 KineMatik is an OpenText Solution Extension Partner developing solutions for OpenText Content Suite / extended ECM in the area of Project Management, Business Process Applications, Publisher, Electronic Lab Notebook and Form Builder for Content Suite. 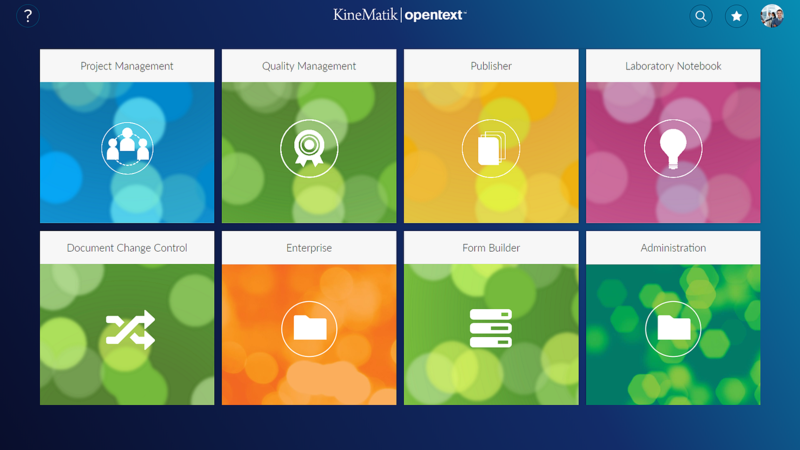 The KineMatik solutions extend your Content Management to all departments enabling an organization to operate more cost effectively and efficiently. Standard and Advanced Project Management tools. Integrated Business Process Applications for Content Suite. Publish complex documents within Content Suite. Multi-discipline enterprise Electronic Lab Notebook. Extend the use of your Content Suite. Save Time & Resources building Forms. 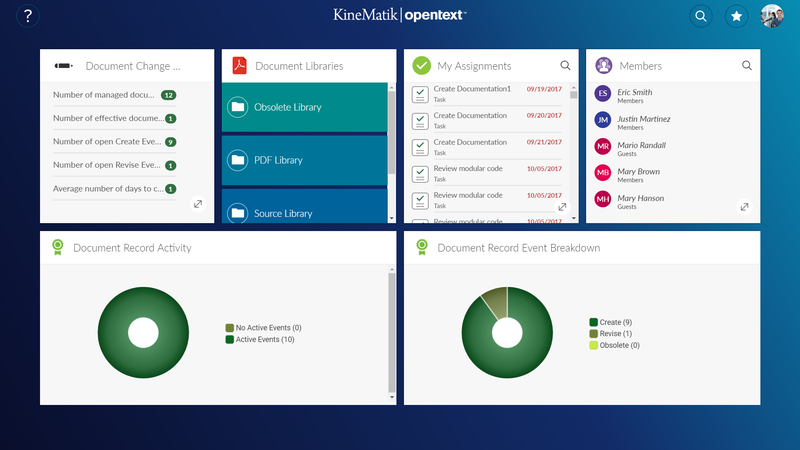 The KineMatik solutions extend your Enterprise Content Management System to all departments from quality to HR departments, from engineering to project management from Document Control to R&D. Our solutions help to solve complex issues and foster the growth of your organization. It is easy to access all documents and records related to KineMatik solutions in a central system. Whatever department, whichever KineMatik Application, all content can be accessed quickly and easily. All integrated to the Content Suite functions such as security, permissions and powerful search engine. 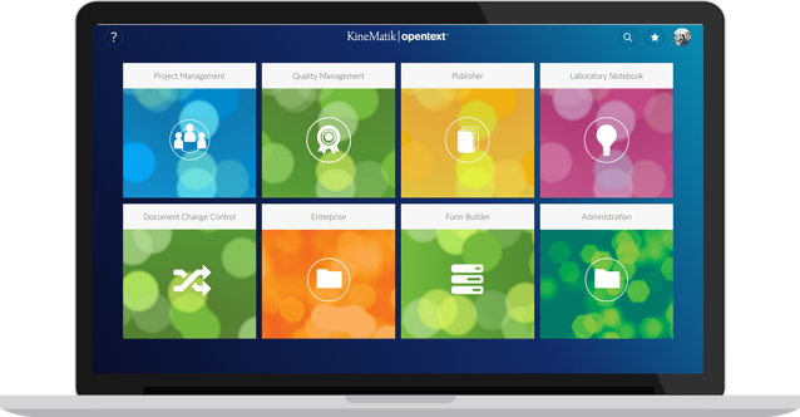 KineMatik Solutions leverage OpenText Content Suite Smart View which is a modern, simple, responsive and intuitive user interface with role based views to your Enterprise Content such as Program and Project Data, Quality Data and your R&D data. Connected Workspaces simplify the deployment of extended ECM and ensure all business data is controlled using permissions and standardized using templates. "It was critical for us to have one source of truth. This was always our main goal when implementing Content Suite, that is to have everything in one place. Everybody needs to be able to access all project related data from one location." "Form Builder has saved us 80% on the time we spend on Form creation. We no longer have to wait for a developer to become available when we want a new Form or amend an existing Form. Any one of us can do it now."